- Publisher A truly historical document, Memory and Identity contains Pope John Paul II's personal thoughts on some of the most challenging issues and events of his turbulent times. Pope for over 26 years, he was one of the world's greatest communicators and this moving book provides a unique insight into his intellectual and spiritual journey and pastoral experience. Each chapter suggests the answer to a question which either exercised his mind or which he provoked in discussion with laymen and priests. Using the encounters at his summer residence of Castel Gandolfo where conversations took place with leading intellectuals - philosophers as well as theologians - Pope John Paul II addressed in his book many of the questions which arose from these discussions. Here he leaves for posterity an intellectual and spiritual testament in an attempt to seek the answer to defining problems that vex our lives. 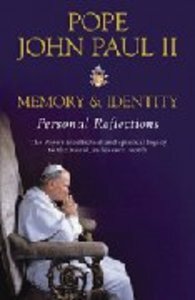 About "Pope John Paul II: Memory and Identity"
A truly historical document, Memory and Identity contains Pope John Paul II's personal thoughts on some of the most challenging issues and events of his turbulent times. Pope for over 26 years, he was one of the world's greatest communicators and this moving book provides a unique insight into his intellectual and spiritual journey and pastoral experience. Each chapter suggests the answer to a question which either exercised his mind or which he provoked in discussion with laymen and priests. Using the encounters at his summer residence of Castel Gandolfo where conversations took place with leading intellectuals - philosophers as well as theologians - Pope John Paul II addressed in his book many of the questions which arose from these discussions. Here he leaves for posterity an intellectual and spiritual testament in an attempt to seek the answer to defining problems that vex our lives.